(Rome) The papal remedy of Misericordina is not a cure. It is bestowed upon some, some not. This is decided according to how the affected parties will fit into the papal line. Last Friday, the Pope visited seven former priests, who were laicized, and allowed to marry. Not participating were the defenders of the Sacrament of marriage and the Church's moral teachings. At least not those who turned in public appeals with the requests to Pope Francis, to correct the controversial passages of the Post-Synodal Exhortation Amoris laetitia or completely withdraw the letter (Katholisches.info reported). On the previous Friday, there were seven former priests who had given up on their priesthood and married. 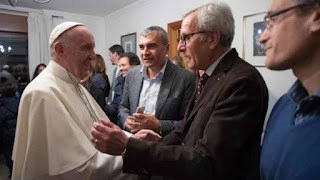 On November 11th, the head of the Catholic Church visited seven "young" men who had given up on their priesthood in recent years, according to the Spanish press agency EFE. The gesture is part of a papal initiative within the framework of the Holy Year of Mercy, which is called the "Fridays of Mercy". On these Fridays Francis holds private visits "without prior notice", according to EFE. This means that the visits will not be announced to the public, so that they can take place undisturbed. At 3.30 pm the Pope left Santa Marta and went to the Roman quarter of Ponte di Nona on the outskirts of the city, where he visited an apartment. "Not less than two hours," Francis met with seven families founded by as many young men who had given up their priesthood in the past years. According to the Vatican Press Office, they belong to the diocese of Rome where "they were pastors in different parishes of the city." One was from Madrid and another from Latin America, both of whom live in Rome. The seventh is from Sicily. Pope Francis "gave his affections" to these men and their families, who "devoted themselves to priestly ministry in the parishes for several years," the Vatican said. "Loneliness, misunderstanding and fatigue because of the great effort and pastoral responsibility have brought their original decision for priesthood into a crisis." They would have spent "months and years of uncertainty and doubt," which often led them to make the wrong decision with the priesthood. Therefore, the decision to give up the priesthood and establish a family," says the press release of the Vatican. "In this way, Pope Francis once more offered a sign of mercy to those who live in a situation of spiritual and material discomfort," and to make it clear that no one should remain without "the love and solidarity of their shepherds." The Holy See did not announce the visit to the "Friday of Mercy", yet there is an interest in making the case public. In the past, Francis had explained that the question of the married ex-priests "is on my agenda." There followed a series of signals around the "Amazon Workshop" that the "practice" of priesthood admission criteria could be changed while maintaining the teaching. The visit to seven former, married priests is also read as a signal that fits into this picture. It is also astonishing the way the Vatican press office has expressed itself on the office of the priesthood. Francis. The Hillary Clinton of the Catholic Church. I wish that he would follow their example! What on earth is all this about? Presumably these are people who have mistaken their vocation and chosen to leave the priesthood and get married. My understanding has always been that this is perfectly in order in the eyes of the Church. Why then are they described as being in a state of spiritual and material discomfort? I question the reason why these 7 men left the priesthood. Did Modernism discourage them in living their priesthood? Or were they Modernists who destroyed their own vocation? I think if Bergoglio was so warm and understanding to them, they are probably Modernists. If so, goodbye and good riddens and take Bergoglio with you. If they were ordained in the new rite or by a new rite bishop,there is much doubt if they were "ordained" in the first place. For the sake of their salvation, it would be better for these men if the new rites are indeed invalid. We won't know until we have a roman catholic Pope. They followed the Lutheran route, isn't that what happened to those who chose to 'go with Luther' that faith Francis has elevated and celebrates at present. Maybe this ties in with his future plans for the Church. I wish they would form a cult and start their own little Jonestown or whatever town the cathars lived in and move far away from us. I really don't see what the fuss is. I'd much rather have priests leave to get married--or not leave, and get married. It's better than carrying on with the housekeeper, and a lot better than molesting boys. Get married and you have to give up functioning like a priest; molest boys, and they just transfer you to another parish, if that. I don't get it. Good question! There are a number of difficulties to which one could point as to the cause of these "hardships"...they simply may be lazy. In general however,the ultimate purpose of all of the things this "pope" does is for the utter destruction of the Priesthood of Christ of which all priests partake. His visit to the newly anointed "high priest" for the new temple in Jerusalem, praising him and the top muslim cleric there at the temple mount is in absolute contradiction to the very purposes of the coming of Jesus Christ; it is to slap Christ in the face as the Roman guards did when they forced the crown (helmet) of thorns on His Sacred Head, and beat it down with a rods. He is a monster.....Judas will fair better than this man at the general judgement. You could easily apply that argument to any Christian doctrine widely held as inviolable till the cultural revolution of 1968. Why not allow unmarried adulterers to receive Communion? That's what people do.. you can't possibly expect everyone to stay married for life these days... c'mon! And your argument that a married clergy isn't going to sexually abuse children is so ridiculous, it doesn't deserve comment. Do CTA people like yourself still circulate that nonsense? Another sign or gesture sent by Francis to point in the direction he wants everyone to follow, in lock step. He is an expert in this tactic of subliminal semiotics: meet someone---transgendered couples, homosexual couples, Muslims at the liturgy, ad nauseam---to point to the direction where he intends to take us all, whether we like it or not. He is both a ravenous wolf and a ruthless tyrant. Make no mistake: unless he is stopped, he will impose women deacons (first, and eventually priestesses), a married clergy, and ample acceptance of divorce and remarriage. Doctrine and truth mean nothing to him; they are mere inconveniences to be overcome. He does not have the Catholic Faith. Clerical celibacy isn't 'Christian doctrine'; it's simply a practice or discipline. It has both advantages and disadvantages, both spiritual and temporal. Nor was it inviolable until 1968. Compared to a nominally celibate but homosexual priest, I'd say the chances of a married priest molesting a child are infinitesimal. And I have no idea what the CTA is, but it sounds like something I'd like to join. Sign me up! It's an inviolable law, confirmed by the Council of Elvira and alluded to by Christ Himself, among other things, which affirms its apostolic origins. If you want a religion which bends to the capricious and feeble desires of your contemporaries, you have many sects to chose from without demanding the Catholic Church change doctrines handed down by the apostles themselves. CTA is Call to Action. They're friends of the Pray, Tell blog, you'd love that! This'll make you laugh, but I'm already a member of Call to Action...though it's hard to get to meetings very often, because of other commitments. When I do, I like to tell them that Vatican II was a failure, and challenge them to get over their Ultramontane sensibilities (such as insisting on imposing the Novus Ordo on those of us who prefer the Tridentine mass). You'd be surprised...one woman came after me afterwards and told me about the beautiful motets they used to sing at her school, now all but forgotten. The council of Elvira was a local synod of little importance; even its date is uncertain (hence its moniker: 'Elvira, mistress of the dark'). I know this because I googled it. St Peter, as I recall, was married. The Catholic church has never universally insisted on priestly celibacy; that's only been the case in the west, and of rather late date. The Orthodox, who in some respects are more catholic than we are, allow for pre-ordination marriage of priests. Funny you don't make the obvious logical, institutional and geographic connections between CTA people and deviants such as those hypocrites at Collegeville. They haven't met a tradition in the Catholic Church they really didn't believe should be upended, altered and dismissed. Elvira was confirmed by Carthage as witnessed by the perennial discipline of the Catholic Church which transmits wholly and faithfully the message of Jesus Christ. Priests were always expected to be continent, whether they were married or not, whether from the East or West. Anyway, the Orthodox preserved the teaching differently, as monks and bishops were expected to be celibate and unmarried. Jesus said to them, I promise you, in the new birth, when the Son of Man sits on the throne of his glory, you also shall sit there on twelve thrones, you who have followed me, and shall be judges over the twelve tribes of Israel. And every man that has forsaken home, or brothers, or sisters, or father, or mother, or wife, or children, or lands for my name’s sake, shall receive his reward a hundredfold, and obtain everlasting life. But many will be first that were last, and last that were first. I don't know this, not being a priest myself, but I imagine it's a lot easier to stay celibate when you keep yourself ad orientem. Whereas when you're facing the people, and you've got some Natasha Kaplinsky look-alike in the first pew, lustrous eyes following your every move, her pale, exquisitely formed lips replying 'peace to you,' well, it must be awfully hard to keep your mind on your job. Ad orientem in spirit as well as in bodily posture.Focus on The Lord in heart and soul and His soul giving grace and not on anyone pewsitting.